The attic is probably one of the most overlooked areas of your home. Having a safe and sturdy ladder can make every visit to the attic less difficult, quicker and less dangerous. A functional ladder in your attic will make the difference between a functional storage and one that is ignored along with everything inside it. Gone are the days of boring old, foldable wooden stairs. Today’s attic stairs and designs have truly evolved and are now modern, stylish and fun. Stair Solution provides attic ladders and stairs that are pre-assembled and easy to install. Setting up an attic step ladder or fold-down stair can be a really easy DIY project that can take just a couple of hours. Attic ladder kits are made to fit between the current framing of your attic and your ceiling. You might have to enlarge your existing attic access hole just a little in order to get your new kit to fit. Be sure that the end of your ladder sits in a safe part of the opening and you have plenty of room to move. The attic floor and roof are most likely framed with either trusses or perhaps individual rafters as well as floor joists.The truss roofs work as an interlocking device and the elements should not be cut, while typical framing can be reorganized quickly. Standard sized attic step ladder sets are made to fit between floor joists with 24″ spacing. What this means is there is about 22 1/2″ of open area between each joist set. If the space between the framing is 22 1/2″, and the gap falls over exactly where you’d like to fit the step ladder, you’re in good luck. If not, extra framing will be needed. Full-size loft ladders and stairways usually require an opening in the ceiling that is no less than 22 1/2 x 54″. This is the first thing that you should consider before installing stairs in your attic. Also, make sure that there is an appropriate landing spot in the attic, to help you easily mount and dismount the step ladder. Carefully consider headroom, as well. You definitely want to avoid bumping your head against the roofing every time you make use of the ladder. Lastly, be sure that there’s sufficient open space in the area and on the ground below the attic opening to support the ladder when it is expanded all of the way. These dimensions differ by ladder style and design. 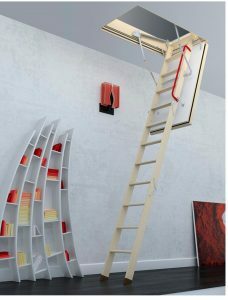 You can buy loft ladders in different lengths. Make sure to determine the space from your ceiling to the floor before you begin shopping. Weight refers to the load capacity of the step ladder itself. As a rule of thumb, the more weight a ladder can hold, the stronger it is. Most importantly, purchase a ladder that can deal with the weight of the heaviest individual who will be using it Also, take into account the heaviest pack they will be carrying along. There are attic ladders made of lightweight aluminum, steel, and timber. Aluminum is usually the best all-around option just because it is lightweight and durable. Additionally, it is a rust-resistant material, so it’s unlikely to be subject to dampness and temperature through the years. A wood ladder may very well survive as long as the property, but being a natural material, it is in theory more susceptible to the effects of humidity and temperature change. You will also have to take into account potential natural flaws. Our selection of attic stairs and ladders are available in many styles and layouts. Their various features are made to boost comfort, safety, and overall functionality. Whether you are adding attic stairs to a new home or replacing an old worn ladder, Stair Solution offers a variety of styles and brands.